Photograph of the five eldest sons of Rev. Libero Sauro in military uniform, Toronto, ON, 1943. All five sons served in the war even though their father was considered an enemy alien. Top L to R: Italo Sauro (Canadian Army) and Alberindo Sauro (Canadian Army). 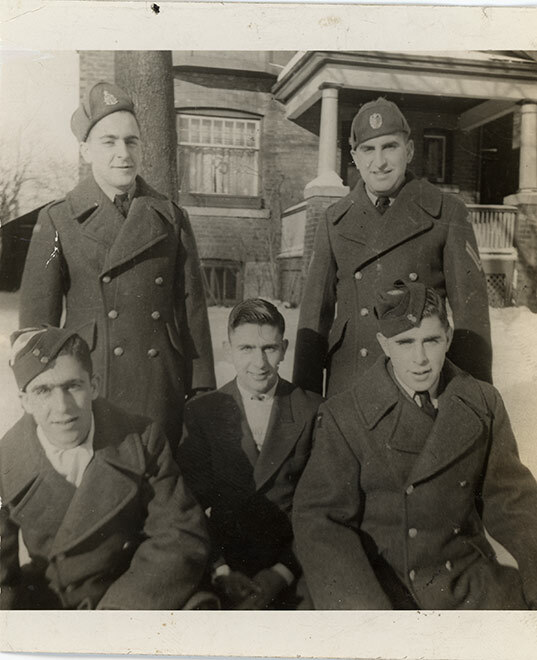 Bottom L to R: Enrico Sauro (Canadian Air Force), Livio Sauro, shown in civilian clothing, (Canadian Army), and Olindo Sauro (Canadian Air Force).